Everything you ever wanted to know (and probably more) about regional pizza styles. deSignet International's pizza jewelry is available in a few styles. The pizza charm on the left comes in different sizes and with synthetic or real rubies, or as earrings. There are full pie charms and pizza slice bracelets, rings that come either as a normal triangle slice or a square slice, but I think my favorite piece by far has got to the pizza cutter charm, which you can get in silver or gold. So cute! 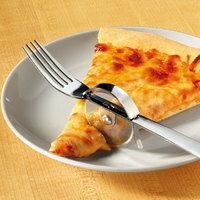 I didn't realize I needed a pizza fork. Described as a "time saver." Wow. Illinois pizza farm draws tourists. "R" Pizza Farm is "a half-acre circular plot divided up like the slices of a huge pizza. Each of the eight wedges represents something used on a pizza - from tomatoes to peppers to herbs including rosemary and sage. Three goats represent milk and Cleo the cow is symbolic of beef. Seven penned-in pigs illustrate pork." They do tours from April through October, teaching people about farming and organic growing, and wrap by serving pizza made mostly with ingredients from the farm. Is pizza going to cost more as gas prices climb? "Domino’s has already helped its drivers, who provide their own cars and gas, offset the impact of rising pump prices by increasing the amount it pays them per delivery," but they might have to raise their prices if gas stays this expensive in the long term. And did you know that Domino's drivers cover 9 million miles in a week just in the US? That's a lot of driving in the suburbs! Domino's added steak pizza to their menus on Tuesday. "The new Steak Fanatic Pizza combines Angus steak, roasted onions and mushrooms with a special sauce and a mix of American and provolone cheeses. A medium Fanatic pizza costs $9.99 with the option of an extra $2-portion of steak." Living in NYC, with a pizza place three blocks away—at most—at all times, I make fun of people who order from Domino's, but clearly I will have to be a hypocrite and try this. And you better believe I'm getting that extra $2-portion! SF A first bite at just opened Pizzeria Delfina. Could this be the best pizza in SF?